Ricardo Azevedo, a Public Officer from Sao Paulo – Brazil, has seemingly invented a motorcycle which runs on water and not fuel. He claims that his ‘T Power H2O’ bike can travel up to 310 miles on just a single litre of water. To prove his point, Mr Azevedo filmed himself drinking from a bottle of water and then pouring the remaining liquid into his bike. He later also filmed himself filling the bike’s tank with water straight from the Tiete River. The bike apparently uses an external car battery, which produces electricity and separates the hydrogen and water molecules. This process creates combustion, and the resulting energy can power the bike for up to 10 hours of riding. The key advantages of this prototype include a massive saving on fuel, never worrying about finding a petrol station to refill again, and a much better environmental footprint as the exhaust expels water vapour instead of carbon monoxide. Mr Azevedo was assisted on this project by his son who is a chemistry professor, and both have defended their prototype against a barrage of questions and criticism. Mr Azevedo has even gone so far as to ask an official Honda dealership and a qualified mechanic to assess the bike, and give independent feedback on the mechanics. 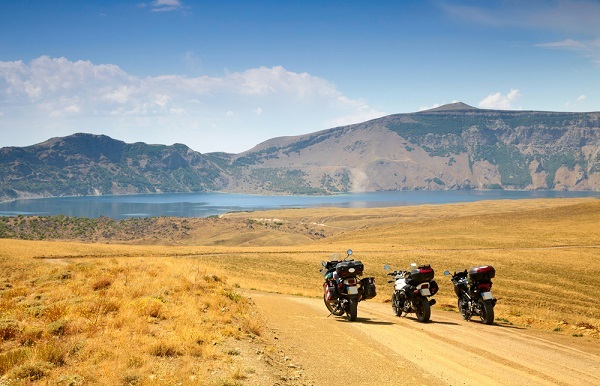 If you’re planning a motorcycle tour, don’t forget to invest in specialist travel insurance from Holidaysafe.co.uk.